Lent is a little over a day away and we are reminded that we need to draw ourselves closer to God through our actions, words and thoughts and prayers. My challenge to all of you this year is not so much in giving up anything like chocolates, movies, fancy dinners, drinking, soda/pop or tv shows (though they are commendable as well as they are cravings of the flesh and are a good way of preparing yourself for the Easter Mysteries) but I would like to suggest that we all increase our prayer time! Increasing prayer time means we increase the number of minutes we communicate with Our Lord. You can offer the 10-15 minute drive you have from your house to work or school and offer prayers for your co-workers, classmates, family, those who are in dire need of prayers or whomever you desire to offer it that day or throughout Lent. Probably you can join us this First Friday of March and instead of meeting up with friends for Happy Hour, you can be at mass, receive the Sacrament of Reconciliation and offer half an hour up to close to midnight if your body can do it and sit/kneel in front of the Blessed Sacrament and talk to Jesus! (See First Friday Devotion page for more information.) You can also start attending daily mass if your schedule permits it. One can also start reciting the Divine Office prayers (see Membership Forms and Materials for Members page for the Divine Office website and you can listen to it on your phone or computer when you have time.) There are numerous ways that you can draw yourself closer to Our Lord this Lenten Season. Pray and let the Holy Spirit guide you and listen to Him who created the Universe and see what you are called to do this Lenten Season. Give up your precious personal time to the One Lord, One Savior who gave up His life for your sins. We all have bad days, offer it up to God. We are all busy as we are employed, or we own our businesses, we are graduate students, we are busy with our own families but we also need time to spend some time with our God. 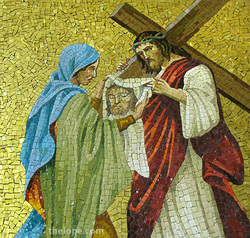 On Sunday, March 18, after the 5:15pm Mass, our group will do the Stations of the Cross at the Cathedral. Bring a friend, a fellow Catholic, your family or siblings and help them draw closer to God. After that, they can join us in socializing at the undercroft afterwards. This Lenten Season, as most of you will probably endure some type of Spring Cleaning, I would like you to see if you have clothes that you have not worn forever or shoes that you don't use that you can donate. Let us do something for our unfortunate brothers and sisters by donating them to through the Bishop Griffin Center (work of St. Vincent de Paul). Let me know through email if you are planning to donate clothes, shoes or sleeping bags. Monetary donations will also be accepted, if that is what you prefer to do. I plan to give it to them the week before Holy Week or right after. Collection will be done at a future date which will be mentioned once I have an idea of how much donation we have. Do not forget, Ash Wednesday and Good Friday are the days of fasting (one full meal, two light meals) and every Friday in Lent is a day of abstinence from pork, chicken, beef or lamb products. May all of you have a wonderful and blessed journey towards the celebration of the Sacred Mysteries this Easter!